In one stroke, you can beautify and heal your marketing campaign with this accurate, human-verified, extensive tool from Bookyourdata.com. Find and market to the experts in plastic surgery easily with this downloadable directory. Get emails, numbers, names, addresses, and more! 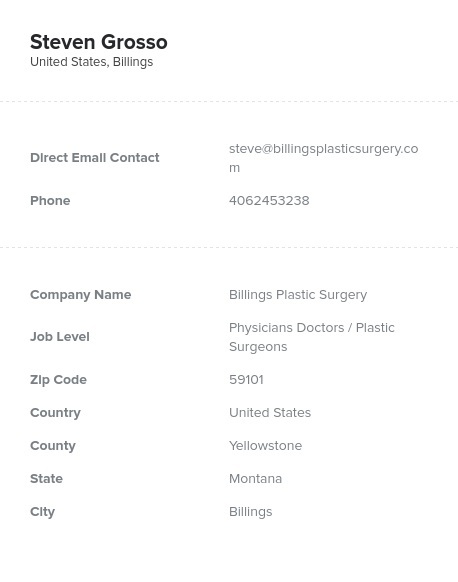 Give your medical marketing campaign a facelift with this ready-to-download plastic surgeon directory. Within moments, you can download and start using this list to get in touch with this highly sought-after group. Get all of the information you need to make a connection, and start communicating right away at no extra cost. Network with plastic surgeons at many institutions all in one go with our database. Famous for performing both cosmetic surgeries like rhinoplasty (or a “nose job"), tummy-tuck surgery, and breast reduction and augmentation surgeries and reconstructive surgeries on trauma patients, plastic surgeons work hard to improve the appearances and livelihoods of their patients. Though their work is not exclusively cosmetic, plastic surgeons often perform their surgeries for those wanting cosmetic changes. They target a specific audience, and if your medical equipment or product also is oriented toward this audience, why not market to and be recommended by their doctors? This list is perfect whether you're aiming to sell a skin cream, a medical device, or a unique therapy. Connect with plastic surgeons easily with our list, and perhaps you'll have a rejuvenated marketing campaign. Pull this list; it's ready for you to try out now!